The earliest roots of DOVE International go back more than 40 years ago to a group of young Christian believers who had a burden to reach out in love to the un-churched youth of their local community in northern Lancaster County, Pennsylvania. This was a time in the USA in which youth were turning to God in record numbers after a decade of tumult in which many had sought answers for life by dabbling in the occult and drug culture. These believers set out to initiate creative and culturally effective ways to reach young people with the love of Jesus. Through friendship evangelism, dozens of young people began coming to Jesus. A weekly Bible study group was established for these new believers under the direction of Larry and Laverne Kreider. The young people were taught simple truths from scripture and encouraged to love Jesus with all their hearts. In this informal group setting, many began to experience a genuine relationship with Jesus and a growing depth of relationship with each other. Although the team working with Larry and LaVerne did their best to help the new believers find church homes, they simply did not fit into the established churches in the community. 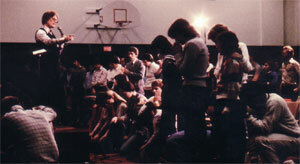 During this time God spoke to Larry in prayer and asked if he was willing to be involved in the “underground church.” An underground church would consist of believers gathered together in small groups meeting in homes (underground, in a manner of speaking) to pray, evangelize and build relationships with each other. These small groups provided the opportunity for people to experience a Christian faith which is built on relationships, not simply on meetings. In these informal settings, people could readily share their lives with each other and reach out with the healing love of Jesus to a broken world. They desired to follow the pattern in the New Testament church as modeled in the book of Acts where the believers met from house to house. Two home groups were started, led by a few young couples committed to discipling new believers. At 5:00 a.m. every Saturday, 12-15 believers prayed for wisdom to start a new church – a new wineskin (Luke 5:38) – tailor-made to serve and disciple these new believers in Jesus. After months of prayer, the Lord gave them the green light to begin. Another small group was added and in October, 1980 these groups met together in a large living room for their first Sunday morning celebration. DOVE (Declaring Our Victory Emmanuel) Christian Fellowship was born. The vision was simple: we were called to pray, make disciples and reach the lost. This was done relationally through small home groups. At the same time, we had lots of growing pains. Within the first six months, the original three small groups became two groups—we were multiplying backwards! But the Lord was so faithful to give us spiritual mentors to help us to identify some of our mistakes and mature in our understanding of the basics of biblical leadership. To be able to experience the blessing of becoming an international family of churches worldwide, we had to make some difficult decisions. During the first ten years of DOVE Christian Fellowship, our church grew to over 2,000 believers scattered throughout a seven-county region of Pennsylvania. We met in more than 100 small groups during the week and on Sunday mornings came together in larger clusters of congregations in eight different locations. We realized that as people are trained, they should be released (or given away) to start new churches. Multiplying people and allowing them to move out on their own affords limitless potential. In 1996, our church decentralized and became eight small group-based churches in Pennsylvania, USA along with three other churches in the nations of Kenya, Uganda and New Zealand. Consequently we turned over the leadership and ministry of the church to eight “senior elders” and their leadership teams. We often use the term “senior elder” rather than “pastor” because the primary leader of a church may or may not have the actual gift of a pastor. An International Apostolic Council was formed to give spiritual oversight to this new apostolic movement of DOVE, and Larry Kreider was asked to serve as the international director. Unlike an “association of churches,” which gives ordination and general accountability to church leaders, an “apostolic movement” is a family of churches with a common focus—a mandate from God to labor together to plant and establish churches throughout the world. We have found apostolic ministry provides a safe environment for each partnering congregation and ministry to grow and reproduce themselves. This new model emphasizes leading by relationship and influence rather than hands-on management. A senior elder and team have a leadership gift to equip believers to do the work of ministry in small groups within a congregation. The Apostolic Council members give training, oversight and mentoring to local church leadership. They also are called to give clear vision and direction to the entire movement. Our transition from one church in Pennsylvania to eight allowed the old structure to die so we could experience the new—a network of small group-based churches and house churches partnering together. Since that time, we have had the joy of seeing dozens of churches planted and others join the DOVE International family. 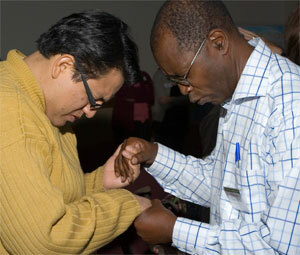 Currently, approximately 350 small group-based congregations and house churches serve together with the DOVE family from many nations of the world including: the United States, Barbados, Brazil, Bulgaria, Canada, Colombia, Democratic Republic of Congo, Guatemala, Haiti, India, Ireland, Kenya, Myanmar, the Netherlands, Peru, the Philippines, Rwanda, Scotland, South Africa and Uganda. We continue to trust God for many more new churches to be started for a new generation of believers in Christ in the nations. We are ordinary people who have made lots of mistakes and have stories to tell that are not all success stories. But one key we have seen is the necessity of embracing spiritual parenting. Each believer needs practical input from loving, seasoned fathers and mothers whose goal is to help them reach their full potential in Christ. Parents expect to see their children grow. Over these 35 plus years, it has been a privilege to watch many who were once “children” become spiritual parents and grandparents as new believers, small groups, and churches are added to our DOVE family. The Bible tells us that without a vision the people perish (Proverbs 29:18). As we continue to grow as an international church movement, we are called by God to fulfill the vision He has given us to build the church with an “underground” focus in the nations of the world. We are called to love Jesus, love His people and love the broken world in which we live. And our desire is to experience the daily reality of living the Kingdom – transforming our world from house to house, city to city and nation to nation.